Today, May 13th, 2017, marks the centenary of the apparitions of the Virgin Mary to the three shepherd children of Fatima, Servant of God Lucia Santos, and St. Jacinta and St. Francesco Marto. Pope Francis will celebrate the extraordinary level of heroic virtue displayed by these little children by canonising the two siblings who succumbed in childhood to the worldwide Spanish Flu pandemic. It is well known that the timing of the apparitions of Our Lady of Fatima was intimately related to the rise of the Soviet Union - the first time in history where the atheistic ideals of Marxism had achieved realisation within the theatre of global politics. This point in time, when the millenarian ideal of secular messianism had came to full fruition, anticipates the reign of the Antichrist, when humanity will be deceived into glorifying itself "in place of God and of his Messiah come in the flesh" (CCC 675), and embrace a form of totalitarianism that falsely promises to establish an earthly utopia. So it can rightly be said that Our Lady appeared at Fatima in order to oppose the introduction of this militantly atheistic regime in anticipation of what the Catechism calls the "deception of the Antichrist". In doing so, Our Lady was fulfilling her perpetual role encapsulated in the Protoevangelium, wherein she must be continuously invoked to crush the head of the Serpent. I would like to use this post to highlight another lesser-known theme which pervades the imagery and timing of the various apparitions received by Sr. Lucia, which provides us with a better insight into the true meaning of the Third Secret of Fatima. This theme revolves around the destiny of the Jewish people, and the role the Jews have to play in the Parousia, which both Scripture and the Catechism informs is suspended until the future conversion of the race chosen by God to bring about the redemption of the world. (June 13, 1929). I had requested and obtained permission from my superiors and my confessor to make a holy hour from 11:00 p.m. to midnight, from Thursday to Friday of each week. Finding myself alone one night, I knelt down near the Communion rail, in the middle of the chapel, to recite the prayers of the Angel, lying prostrate ... Feeling tired, I got up and continued to recite them with my arms in the form of a cross. The only light was that of the [sanctuary] lamp. Under the right arm of the cross was Our Lady with Her Immaculate Heart in Her hand ... (She appeared as Our Lady of Fatima, with Her Immaculate Heart in Her left hand, without sword or roses, but with a crown of thorns and flames) under the left arm [of the cross], in large letters, like crystalline water which flowed over the altar, forming these words: "Grace and Mercy". I understood that the mystery of the Most Holy Trinity was shown to me, and I received lights about this mystery which I am not permitted to reveal. I rendered an account of this to my confessor, who ordered me to write down what Our Lord willed to be done. (Fatima in Lucia's Own Words, pp198-199). Then shall appear the sign of the Son of Man in Heaven; Matthew 24:30 that is, the cross being brighter than the sun, since this last will be darkened, and hide himself, and that will appear when it would not appear, unless it were far brighter than the beams of the sun. But wherefore does the sign appear? In order that the shamelessness of the Jews may be more abundantly silenced. For having the cross as the greatest plea, Christ thus comes to that judgment-seat, showing not His wounds only, but also the death of reproach. Then shall the tribes mourn, for there shall be no need of an accusation, when they see the cross; and they shall mourn, that by His death they are nothing benefited; because they crucified Him whom they ought to have adored. Do you see how fearfully He has pictured His coming? How He has stirred up the spirits of His disciples? For this reason, let me add, He puts the mournful things first, and then the good things, that in this way also He may comfort and refresh them. And of His passion He suggests to them the remembrance, and of His resurrection, and with a display of glory, He mentions His cross, so that they may not be ashamed nor grieve, whereas indeed He comes then setting it forth for His sign. And another says, They shall look on Him whom they pierced. Therefore it is that they shall mourn, when they see that this is He. And forasmuch as He had made mention of the cross, He added, They shall see the Son of Man coming, no longer on the cross, but in the clouds of Heaven, with power and great glory. So in being shown this vision of a cross of light accompanied by the outpouring of the words "grace" and "mercy"(following the scene described in Zech 12), God was revealing to Sr. Lucia that the future conversion of the Jews was an essential component of the message of Fatima. Scripture tells us that the future conversion of the Jews will be brought about through the ministry of the Elijah to come - the one who must restore all things before the Second Coming of Christ. After admonishing them to give heed to the law of Moses, as he foresaw that for a long time to come they would not understand it spiritually and rightly, he went on to say, And, behold, I will send to you Elias the Tishbite before the great and signal day of the Lord come: and he shall turn the heart of the father to the son, and the heart of a man to his next of kin, lest I come and utterly smite the earth. Malachi 4:5-6. It is a familiar theme in the conversation and heart of the faithful, that in the last days before the judgment the Jews shall believe in the true Christ, that is, our Christ, by means of this great and admirable prophet Elias who shall expound the law to them. So, according to both Scripture and Tradition, the conversion of the Jews will be brought about by the appearance of the Sign of the Son of Man foretold in Zech 12, which in turn is in some way inextricably linked to the culmination of the ministry of the Elijah to come. The reference to the wailing at Megiddo in Zech 12 concerns the death of the good King Josiah, who was killed during the battle of Megiddo in 606BC. We can find the next parallel between Our Lady of Fatima and the prophetic ministry of Elijah in her appearance as Our Lady of Mount Carmel during the Miracle of the Sun. The primary historical and religious importance of Mount Carmel is in connection to the prophet Elijah, given that this was the location of the legendary battle between the champion of Yahweh and the prophets of the Phoenician deity Baal Melqart. Indeed, this contest between Elijah and the prophets of Baal appears to have been the symbolic archetype for the battle of Armageddon foretold in the Book of Revelation. The word Armageddon is derived from the Hebrew Har Megiddo - the "mountain of Megiddo". A curious aspect of this phrase is that there is no "mountain" in the immediate vicinity of Megiddo, which is in fact situated on a plain at the foot of Mount Carmel. The actual fortress town of Megiddo was situated on a small mound (or Tel) on the plain of Megiddo, strategically located at the head of the Carmel Ridge, overlooking the Valley of Jezreel. The section of hills behind Tel Megiddo (called the Menashe mountains) are actually a lower eastern extension of Mount Carmel. So the most likely point of reference for the "mountain" of Megiddo, is in fact Mount Carmel - the location of the contest between Elijah and the prophets of Baal in 1 Kings 18:20-40. It is here that Elijah emerged victorious over the prophets of Baal, and successfully managed to steer the wayward Israelites back to orthodox praxis. So by appearing as Our Lady of Mount Carmel at the close of the vision experienced by the shepherd children during the Miracle of the Sun, the Blessed Mother was alluding to the prophetic ministry of Elijah and the conversion of the Jews - which would once again be brought into focus during the her vision of the cross of light at Tuy in 1929. It seems to be beyond coincidence that the Miracle of the Sun had taken place just before the publication of the Balfour Declaration calling for a Jewish national homeland in Palestine; or that the Battle of Megiddo in 1918 took place just under a year later, the consequences of which led to the land of Palestine falling under the British Mandate, eventually resulting in the restoration of the land of Israel in 1948. Could it be that Our Lady had chose to appear at Fatima at this moment in history not only to warn of the dangers of the spread of Communism, but also to indicate the opening of the path that would eventually lead to the conversion of the Jews, and consequently, to the Second Coming of Christ? The secrets of Fatima were predominantly concerned with the impending onslaught of the Second World War, which ultimately resulted in the extermination of one third of the world's total Jewish population in the concentration camps of the Third Reich. It was through the perpetration of this most unspeakably heinous act that eventually led to the establishment of the modern State of Israel in 1948, when paralleling the Resurrection of Christ, the Jewish people eventually emerged victorious on the other side of their collective crucifixion. For the modern Jewish people, the path to the Promised Land was truly the way of the cross. But it seems that the restoration of Israel was preordained, since it was only through once again establishing themselves in the Holy Land that will eventually allow for the Jews to witness the great sign of the cross appear over Jerusalem, when they will confess Jesus as the true Messiah as a result of the ministry of the Elijah to come. It is ‘the Mother of Heaven’ who says to her: ‘be at peace and write what they command you to, but not that which you were given to understand about its meaning,’ intending to allude to the meaning of the vision that the Virgin herself had revealed to her. That is how she was given the strength to write the Third Secret. In the first edition of my book, I also forwarded the hypothesis that the occurrence of the eschatological earthquake could set in motion a chain of geophysical events that will eventually lead to the eruption of the volcano Cumbre Vieja in the Canary Islands (the "great mountain, burning with fire" described in Rev 8:8); producing a mega-tsunami that will devastate the East Coast of the Americas. As I attempt to demonstrate in the second edition of my book, the exact location of this "burning mountain" is described in the Book of Enoch, which is known to have influenced several of the writers of the New Testament. When we study the relevant portion of the Book of Enoch in light of its roots in Greek mythology, we can determine that it does indeed refer to a volcano based in the Canary Islands. The section of the Book of Zechariah which was associated with the appearance of the Sign of the Son of Man by the Early Church Fathers is also closely linked with the occurrence of the eschatological earthquake. A reference to this event can be found at the very start of Zech 12, and it is expanded upon in more detail later in chapter 14. After the scene depicting the inhabitants of Jerusalem looking on the "one whom they have pierced", the Prophet Zechariah then describes the opening of a fountain for the cleansing of the sins of Israel - the future conversion of the Jews. It is tempting to connect the above passage to the Second Coming itself, given the mention of God's feet touching the Mount of Olives - the place where Jesus ascended into Heaven. However, given the fact that we are told that this event has further consequences within history itself, we are forced to conclude that this verse should not be interpreted literally, and may be considered as one and the same as the appearance of the Sign of the Son of Man mentioned earlier in Zech 12. 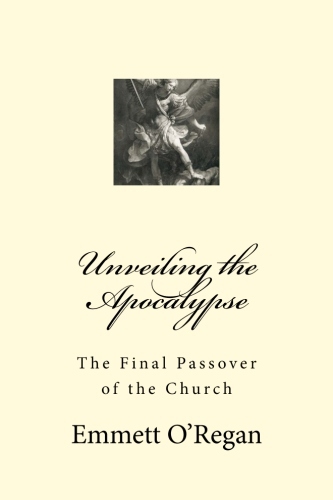 The Church teaches that the Second Coming of Christ will only occur at the very end of human history, coinciding with the General Resurrection of the dead; while the event described in the Book of Zechariah is clearly concerned with the future conversion of the Jews. 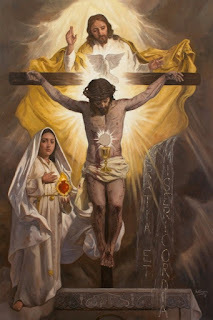 The light foretold to appear in the eventide therefore must be one and the same as the great cross of light spoke of by the Church Fathers and numerous mystics, including Sr. Lucia's 1929 Tuy apparition. So the vision of the earthquake and tsunami that Sr. Lucia saw while she was instructed to write down the contents of the Third Secret in 1944 was a prophetic extension of the vision of 1929, informing us that these apparitions, together with the Third Secret itself, form a visionary triptych based on chapters 12-14 of the Book of Zechariah. A section of the Bible which revolves around the appearance of the Sign of the Son of Man and the Jews' recognition of Jesus as their promised Messiah. What value can prophecy such as Fatima possibly have if it doesn't mention the Shoah, the extermination of the Jews at the hands of the Nazis? Why is the prophecy so lopsided? But now even the hypercritical are satisfied. A recently published booklet for the use of pilgrims to Fatima contains a sort of spiritual diary written by Sister Lucia at the request of the then general of the Carmelite Order, Anastasio Ballestrero, who went on to become cardinal archbishop of Turin. In this diary, Sister Lucia adds an interesting---sensational?---coda to the second part of the message, which predicts that World War I is about to end and warns that another war may break out during the ponificate of Pius XI. We should note Sr. Lucia's quotation of Christ's words in John 4:22: "Salvation is from the Jews". This passage of Scripture has historically been associated with the future conversion of the Jews, which both St. Paul and St. Peter inform us must take place before the Second Coming of Christ. As I have previously discussed at some length in the post Our Lady of Fatima and the Jewish Holocaust, the fact that the Blessed Virgin appeared to the shepherd children adorning a yellow star appears to have been in a symbolic act of solidarity with her fellow Jews. The presence of this star, accompanied by the fact that Our Lady always appeared to the shepherd children on the 13th of each month, strongly alludes to the Jewish feast of Purim and the biblical story of Esther (whose name means "star"). The feast of Purim celebrates the victory won on the 13th of the Jewish month of Adar, when Esther, the Jewish Queen of Persia, rescued her people from destruction at the hands of the evil Haman, who wanted to kill all the Jews living in the Achaemenid Empire. Purim is celebrated each year on the 14th of Adar, the day after Esther achieved victory over Haman by exposing his plot to her husband, the King of Persia. It is worth noting that Sr. Lucia died on the 13th of February, 2005 - the month in the Gregorian calendar which corresponds to that of Adar. Taken together, this strongly suggests that the intercession of the Blessed Mother was involved in the rescue of the Jewish people from total extermination by Nazi Germany and the creation of the modern State of Israel - which was proclaimed on 14th May, 1948 - the day after the feast of Our Lady of Fatima. And when they have finished their testimony, the beast that rises from the bottomless pit will make war on them and conquer them and kill them, and their dead bodies will lie in the street of the great city that symbolically is called Sodom and Egypt, where their Lord was crucified. (Rev 11:7-8). The seventh angel poured out his bowl into the air, and a loud voice came out of the temple, from the throne, saying, “It is done!” And there were flashes of lightning, rumblings, peals of thunder, and a great earthquake such as there had never been since man was on the earth, so great was that earthquake. The great city was split into three parts, and the cities of the nations fell, and God remembered Babylon the great, to make her drain the cup of the wine of the fury of his wrath. At that time shall arise Michael, the great prince who has charge of your people. And there shall be a time of trouble, such as never has been since there was a nation till that time. But at that time your people shall be delivered, everyone whose name shall be found written in the book. And many of those who sleep in the dust of the earth shall awake, some to everlasting life, and some to shame and everlasting contempt. (Dan 12:1-2). Yet, because our adversaries do not admit this reasoning (nor is it now the time to deduce from their own principles), we will prove it from the testimonies of the Fathers. Thus Hilary, explains these words of Matthew: “The Gospel of the kingdom will be preached in the whole world, and then the consummation will come.” Clearly he teaches that Antichrist, which he calls the abomination of desolation, is not going to come unless the preaching of the Gospel will precede him throughout the whole world. St. Cyril, Theodoret, and St. John Damascene teach the same thing with eloquent words, and besides, the same is gathered from the text because the Gospel says that before that greatest and last tribulation shall come, the Gospel must be preached such as it was not before nor will be afterward. The Fathers and above all, St. Augustine, teach that the persecution of Antichrist is meant by such a tribulation.."
blood that today too is shed in the wars tearing our world apart. yesterday, today and for all eternity. Today (May 13th), the first reading from the Office of the Readings was from Apocalypse 18:1-20, which is about the world's reaction to the fall of Babylon. The second reading is from St Cyril of Alexander's commentary on the Letter to the Romans, concerning the mercy of God being extended to the Gentiles. These seem to fit in quite well with your post today. It's kind of nice to see things come together like this. The fall of future Babylon and bringing Christ to the Gentiles are things I would not necessarily have associated with Our Lady of Fatima, yet the Liturgy of the Hours brings them in. Wow! A lot to think and pray about. Do you ever give public talks or presentations Emmett? Emmett, in much of this post, you tread the same ground I tread in A While Longer, Chapter 12 - The Meaning of Fatima, so I see we are in agreement on most of it! Our Lady IS the Elijah who is to come and restore all things. - the battle of Elijah against the prophets of Baal is a type for the Woman clothed with sun battling Satan during the 20th century great apostasy. Blessed Mary is, in her apparitions of the 20th century beginning at Fatima, 'Elijah' and like Elijah of old, during a time of great apostasy she has come to restore all things - to restore lost humanity back to faith in the one true God. This, then, will mark the arrival of my hour, when I, in a marvelous way, will dethrone the proud and cursed Satan, trampling him under my feet and fettering him into the infernal abyss." "Elijah's" - Our Lady's - restoration will come about in full with the Triumph of the Immaculate Heart of Blessed Mary. And what is that? Nobody knows. But I have come to believe it is along the lines of the prophet Malachi: 'Elijah' will come to turn the hearts of the people back to God, lest God destroy the world. I think that just before God destroys the world, with the loss of much of current humanity to hell, Our Lady, in the final and complete fulfillment of her role as our intercessor, intercedes for us in a marvelous way that converts the hearts of most of humanity back to God, including giving the Jews an understanding via the Triumph that Jesus is the Messiah. And then, after she appears to the world and converts most of current humanity, the Sign of the Son of Man comes, and the Jews mourn and fully convert, and much of humanity is saved. And with Our Lady of Fatima and Our Lady at Medjugorje, Scripture also is being fulfilled right now - we are living it, as amazing and unbelievable as it is, we are that generation foretold in the Bible. Many know this. Eating dinner, a pizza at Columbo's in Medjugorje with many of my pilgrimage group, I turned to fellow pilgrim Bridget and asked her what she thought Medjugorje was all about. After swallowing she looked at me and said, "I think Blessed Mary is preparing us for the Second Coming." I smiled in agreement. Then she added, "It is amazing that this is all happening now, that we are the ones who are witnessing it as it unfolds!" Again, I could only nod in complete agreement. I am a life-long Catholic and I am finding many of the saints like St. John Crysotom and others are forgetting to get back to what the Holy Scriptures said, NOT Fatima etc. Note: Zechariah 14:4 And in the day His Feet will stand on the Mount of Olives, which is in front of Jerusalem on the east; and the Mount of Olives will be split in its middle from east to west by a very large valley, so that half of the mountain will move toward the north and the other half toward the south. AND: Zechariah 12: 10 "And I will pour out on the house of David and on the inhabitants of Jerusalem, the Spirit of grace and of supplication so that they will look on Me whom they have pierced; and they will mourn for Him, as one mourns for an only son, and they will weep bitterly over Him, like the bitter weeping over a first-born. Do not add to His words Lest He reprove you and you be proved a liar! Emmett, i remember once seeing that the accounts of the storm on the sea of galilee in the NT used the word 'seismos', earthquake, seaquake. is it possible that the usual translation of 'storm ,tempest', has been due to a specialized use of 'seismos' in koine, or simply inability to fathom a tsunami on lake galilee? if it should be 'seaquake', does this then place the calming of the storm passage in an interesting end-time aspect? making the calming of the storm more than just a miracle, but a message that the barque of peter will survive the period of the cumbre-vieja tsunamis? Where do you place the Great Monarch and Angelic Pope in this timeline? You say that Our Lady is the Elijah to come? Wrong. The Elijah to come is none other than Elijah, one of Two Witnesses. Enoch is the other Witness to come. These Two Witnesses are alive right now and will be permitted to return to earth to preach against the Antichrist who will put them to death. How do we know that Enoch and Elijah are the Two Witnesses? Partly from Sacred Scripture and partly from the near unanimous opinions of the Church Fathers. Our Lady is most definitely not one of the Two Witnesses. Thanks for sharing that Paul OFS. That is quite a coincidence! mise mé féin - I'm much too shy for that kind of thing. I have a phobia of public speaking. I was wondering about the JP2 quote supposedly made in 1980. I was under the impression that he hadn't read the secret until after he had been shot in 1981.Is this not true? > the Triumph of the Immaculate Heart of Blessed Mary. And what is that? Nobody knows. "You are living out the mystery of this second Advent, which is preparing you to receive Jesus, when He returns to you on the clouds of heaven. Only then will the second Advent through which you are living reach its fulfillment. Then time will attain its fullness. Then will the Immaculate Heart of your heavenly Mother attain her triumph, in the definitive and glorious triumph of her Son Jesus." Greg, I can see where you are coming from, in the aspect of the Blessed Virgin as the Morning Star who appears before the Coming of her Son (as St. Louis de Montfort taught). So to a great extent, yes, she does prepare the way for the Second Coming through this present Marian age. But I'm afraid I would have to disagree with you in that I believe that the Elijah to come will be a future male historical figure who will help to spread the Gospel to the ends of the earth and convert the Jews before being martyred by the Antichrist. Most likely this figure will have a great Marian devotion, and thus place himself under the mantle of the Blessed Mother, but I do think it refers to an individual male personage. To answer anon's comments above, I personally believe that the Elijah to come will either be the Angelic Pope or the Great Monarch. I know all the arguments in favour of it being a literal return of the historical figures of Elijah and Enoch (such as they have yet to die, etc. ), and the fact that there was a near consensus among the Early Church Fathers does give this position a considerable amount of weight. But to me, it seems more rational to propose that God would chose to raise these figures up from within the Church itself, rather than send two ancient prophets back from heaven. And when we consider the fact that the Two Witnesses are based on the High Priest Joshua and Zerubbabel - the rightful heir to the kingdom of Judah, this provides us an aspect of their roles as Pontifex Maximus and the king of a lost throne (the Holy Roman Empire). At the very least, the Angelic Pope and Great Monarch are types of the Two Witnesses. But the fact that private prophecy tells us that it is these figures who will restore the Church, while Scripture teaches it is the Two Witnesses, suggests that there is a certain level of overlap between them. The career of all four also ends in Jerusalem - the pope of Fatima is killed in a city with a cross at the top, the Great Monarch lays down his crown on the Mount of Olives before the rise to power of the Antichrist, while the Two Witnesses similarly meet their fate here. :( but delighted to come across your blog and book; amazing to see the threads I had already come across and many more I hadn't, weaved into a fuller picture with your insight and research. go raibh maith agat. Socci believes that when John Paul II decided to release the Secret, a power-struggle of sorts erupted in the Vatican. He postulates that John Paul II and Cardinal Ratzinger wanted to release the Secret in its entirety, but Cardinal Sodano, then Vatican Secretary of State, opposed the idea. And opposition from a Vatican Secretary of State is formidable. A compromise was reached that sadly reveals heroic virtue from none of the main players. The “Bishop dressed in white” vision, which is the four pages written by Sister Lucy would be initially revealed by Cardinal Sodano, along with his ludicrous interpretation that the Secret is nothing more than the predicted 1981 assassination attempt on Pope John Paul II. At the same time, at the May 13 2000 beatification ceremony of Jacinta and Francisco, Pope John Paul II would “reveal” the other part—the most “terrifying part”—of the Secret obliquely in his sermon. It was here that John Paul II spoke on the Apocaplyse: “Another portent appeared in Heaven; behold, a great red dragon” (Apoc. 12: 3). These words from the first reading of the Mass make us think of the great struggle between good and evil, showing how, when man puts God aside, he cannot achieve happiness, but ends up destroying himself… The Message of Fatima is a call to conversion, alerting humanity to have nothing to do with the “dragon” whose “tail swept down a third of the stars of Heaven, and dragged them to the earth” (Apoc. 12:4). The Fathers of the [Catholic] Church have always interpreted the stars as the clergy, and the stars swept up in the dragon’s tail indicates a great number of churchmen who would be under the influence of the devil. This was Pope John Paul II’s way of explaining that the Third Secret also predicts a great apostasy. If Socci is correct in this analysis, Bishop Richard Nelson Williamson, an English traditionalist Catholic and member of the Society of St. Pius X who opposes changes in the Catholic Church brought on by Vatican II, may have verified his hypothesis in 2005 when he related how a priest acquaintance of his from Austria shared privately that Cardinal Ratzinger had confessed: “I have two problems on my conscience: Archbishop Lefebvre and Fatima. As to the latter, my hand was forced.” Who could have “forced” Ratzinger’s hand to go along with a false or partial statement on the final Fatima Secret? Was it pressure from the papal office, or, as Williamson questions, “Some hidden power behind both Pope and Cardinal?” If Pope John Paul II’s sermon at Fatima did in fact speak to the “terrifying part” of the Final Secret—as in the Dragon’s tail sweeping down a third of the clergy to do his bidding—we are left with the unsettling impression that at least 33 percent (Masonic marker) of the Vatican’s hierarchy are committed to a Satanic Plan. Thank you for this post, Emmett! I was never aware of the significance of the 13th of the month, so the connection to the Jewish feast of Purim makes complete sense. Incredible! I have a question about the False Prophet: You have stated that that the False Prophet could have been Hitler. So how does Rev 16:13-16 fit into place? Is it because even though Hitler is dead, his spirit is still allowed to cause destruction up until the end? And I saw, coming out of the mouth of the dragon and out of the mouth of the beast and out of the mouth of the false prophet, three unclean spirits like frogs. For they are demonic spirits, performing signs, who go abroad to the kings of the whole world, to assemble them for battle on the great day of God the Almighty. (“Behold, I am coming like a thief! Blessed is the one who stays awake, keeping his garments on, that he may not go about naked and be seen exposed!”) And they assembled them at the place that in Hebrew is called Armageddon. I believe that the three demonic spirits should be considered to be the cause of three world wars. The spirit that issues from the mouth of the Dragon takes place at the unbinding of Satan circa 1914, starting WWI, the spirit which issues from the mouth of the False Prophet is the cause of WWII, while the spirit which issues from the mouth of the Beast will be the future cause of Armageddon. This speculation is interesting, as are the writings of Sr. Lucia. Please understand that I am getting old now, but all my life I have followed Fatima and continue to retain faith in the Roman Catholic Church, the Pope and Magisterial teaching, and so on. I have always had the understanding the alleged statements of Pope John Paul II were misinterpreted, that he was referring to a Neues Europa report from 1963, and speculation what might be the context of the secret and a possible explanation as to why the secret was not yet revealed. The Holy Father never read the secret until recuperating from the assassination attempt. He had not read it in 1980. Therefore this story is an invention, a fantasy based upon other private revelations. It has taken on a life of its own as is evidenced by the claims in this essay. As much as I admire your work, your research here regarding the apocalypse, I believe you are in way over your head and have allowed yourself to be misled by conspiracy threads and false accounts based upon dubious secrets from earlier private revelations. Please pardon my straight forward response, but there are many terrible things being said these days against the Church and Pope Francis in connection with Fatima. Your post does not help. I admit that the Fulda thing is open to question. But Sr. Lucia's 1944 vision does speak of a tsunami, and could potentially explain the Holy Father's alleged words at Fulda. But then, as you say, so could perhaps Neues Europa (which is definitely false). I don't think it was based on Neues Europa though. The Washington Post reported in 2000 that the papal spokesman Joaquin Navarro-Valls stated that St. John Paul II read the third secret in 1978, shortly after assuming the papacy (which would then be the text which Cardinal Capovilla said was kept in the papal apartments - the interpretation of the Secret. It was the text in the archives of the Holy Office he didn't read until 1981 (the Bertone text - the actual Third Secret itself). I understand where your misgivings are coming from. But I would never assert that the Church is deliberately holding back this alleged interpretation of the secret because of mention of an apostasy within the Church, which of course has been used as a stick to beat Pope Francis with. My theory is that the Church is holding this interpretation back because of the inclusion of an exact date (Capovilla said that it was not being published because of "minute precisions"). But then again, I could be wrong, and the alleged "hidden text" was actually just the 1944 vision itself. But the fact that this 1944 vision explicitly states that Sr. Lucia had been given an interpretation of the secret by Our Lady herself does suggest that there is something else, unless this interpretation was never written down and Sr. Lucia kept it to herself (which seems unlikely). And of course, if the Church has chosen not to publish this interpretation of the secret because it believes that it may be in some way harmful (e.g. through causing sensationalism), then we must trust its judgement. If any private revelation is leading someone away from the Church, or can be misused in a manner which does so, it should be avoided. I have complete faith in Our Lord's words that the gates of Hell will not prevail against the Church. Thanks Emmett - you are truly a gentleman and scholar and your explanation is very helpful and appreciated. before commenting here I had just read a series of absurd comments on another site. I still believe what we need to know has always been there for us to know, the call to repentance, prayer, penance and true devotion to the Immaculate Heart of Mary. I remember as a child when the secret was not revealed in 1960 many Fatima devotees were not just disappointed, but angry. It was then a series of private revelations began to be pieced together to become the secret many expected. Even after JPII had the secret read, many were even more disappointed and the conspiracy theories gained more strength - once again based up other private revelations. Keep up the good work - I believe legitimate research and scholarship is important to dispell the false interpretations, or deformities, as Pope Francis noted this past weekend. "Greg, I can see where you are coming from, in the aspect of the Blessed Virgin as the Morning Star who appears before the Coming of her Son (as St. Louis de Montfort taught). So to a great extent, yes, she does prepare the way for the Second Coming through this present Marian age"
As you know, I personally concur with your interpretation of the identity of the two witnesses as being spiritual returns, in the manner of typology, of Enoch and Elijah - indeed the Great Monarch and Angelic Pontiff of private revelation. We should recall that some people in the time of Jesus literally expected the historical Elijah to come down from heaven and so were unable to recognise John the Baptist as being "the Elijah who was to come". If Elijah didn't literally come before Our Lord's first advent but rather 'returned' with his spirit and power in the person of John; I find it exceedingly odd to expect a literal coming prior to Christ's second advent. More likely than not, Elijah will "come back" as a different person who embodies his "spirit and power" despite not literally being him. That said, I think that both yourself and Greg raise a good point here. St. Louis de Montfort was of the mind that Jesus will reign through his Second Coming through the intervention of Mary before the Eschaton, just as her agency was essential to his first coming in her womb. "‘When will that happy day come . . . when God’s Mother is enthroned in men’s hearts as Queen, subjecting them to the dominion of her great and princely Son?’" (TD 217). "Toward the End of Time, God will raise up great men full of the Holy Spirit and imbued with the spirit of Mary, through whom this powerful Sovereign will work great wonders in the world, so as to destroy sin and to establish the Kingdom of Jesus Christ, her Son, upon the ruins of the kingdom of this corrupt world..."
These are, of course, the Two Witnesses of Revelation and like you I think they should be identified with the Great Monarch/Angelic Shepherd of private revelation as well. 'You will be converted to us and look to the Day that the Offspring of the the Dawn - of Mary, the Star of the Sea - has shown us'. [For] in these days justice and piety will grow increasingly weary and disappear...Because people attribute this quiet peacetime and fruitful abundance to themselves and not to God and meet once more with lethargy when it comes to religion, so many tribulations will again follow as have never before seethed within the world..."
As you can see, St. Hildegard calls Mary in the above the "the Dawn, the Star of the Sea" who guides mankind towards the "Day of the Lord", the Second Coming by means of the Second Pentecost. (Note too her important rejection of millenarianism in the above: the Christians living during the period of peace before Antichrist and Judgement Day will be "full of joy", the Church Militant will be more closely conformed to Church Triumphant than ever before (that's what she means when referring to the newfound, if brief, friendship of men with the angels in heaven), but they will not be. Capable of "complete happiness" in view of their awareness of the transitory nature of the peace; their longing for eternal life and their dread of the impending tribulations). I think there is a prophetic consensus, of sorts, on this - so Greg does make a good point even if I too disagree with his theory that Our Lady is the Elijah. "...For you yourselves know very well that the day of the Lord will come like a thief in the night. 3 When they say, “There is peace and security,” then sudden destruction will come upon them, as labor pains come upon a pregnant woman, and there will be no escape!..." "...These days will be strong and glorious, full of peace and stability. These days will announce the coming of the Day of Judgement...But because people attribute this quiet peacetime and fruitful abundance to themselves and not to God and meet once more with lethargy when it comes to religion, so many tribulations will again follow as have never before seethed within the world. Therefore, such dangers as we have never known will follow this time of rest and comfort...Indeed torment upon torment and injustice upon injustice will accumulate. At any moment murder and death will be planned for no reason at all...All this is an indication of the coming of the Antichrist.​.."
Thanks for sharing those quotes of St. Hildegard Colin! They are quite important in regards to tackling millenarian ideas in relation to the "period of peace". The Church Doctor St. Bonaventure pondered whether St. Francis of Assisi was the Elijah to come, so there was clearly some strains of thought in the Church which contested the idea of a literal return of the biblical prophet, even if it has only been a minority position. Ephesians 6:12------For we wrestle not against flesh and blood, but against principalities, against powers, against the rulers of the darkness of this world, against spirituaFor we wrestle not against flesh and blood, but against principalities, against powers, against the rulers of the darkness of this world, against spiritual wickedness in high places.l wickedness in high places. It still all comes down to the Jews accepting and recognizing JESUS and those forces are twisting our reality to prevent it. Re the conversion of jews, just which ones are we referring? Orthodox only? Secular and religious? They are exactly organized. If secular jews are included, would this not suggest that pretty much the whole world then will convert? St. Paul prophesied in Romans 11:16 to the effect that, "All Israel will be saved". Thus before the Second Coming there will be a corporate conversion of the Jewish people. Since the time "Israel" is used it would seem to imply all Jews in an ethnic sense and not merely observant, religious Jews. As the Catechism says, "The glorious Messiah’s coming is suspended at every moment of history until his recognition by ‘all Israel,’ for ‘a hardening has come upon part of Israel’ in their ‘unbelief’ toward Jesus [Rom. 11:20-26]. . . . ‘For if their rejection means the reconciliation of the world, what will their acceptance mean but life from the dead?’ [Rom. 11:15]. The ‘full inclusion’ of the Jews in the Messiah’s salvation, in the wake of ‘the full number of the Gentiles’ will enable the People of God to achieve ‘the measure of the stature of the fullness of Christ,’ in which ‘God may be all in all’ [Eph. 4:13; 1 Cor. 15:28]" (CCC 674). As St. Hildegard demonstrated in my quotation, first "the full number of Gentiles" will come into the Church by means of a Second Pentecost and then the "full inclusion" of the Jews shall follow. While we are assured that "all" Israel will be saved, it is debated in regard to the Gentiles. "The full number" is a much more vague, much less precise term than the operative word "all". It could simply mean a substantial majority in every nation or in the earth as a whole. Right now, there is over 2.2 billion Christians out of a population of some 7 billion humans. That's about a third (31 percent) of Earth's current population. 79% are not Christians. That being so, we are still a good bit away in my opinion from the full number of gentiles. Then so many new and unknown arrangements with respect to order and peace will occur that people will be amazed and will talk about them. For such things have not in the past been heard of or known. In this manner peace will be given to them before the Day of Judgement - just as a period of peace came quickly before the first coming of the Son of God. However they will not be able to rejoice fully because of their fear of the judgement that is to come. Instead, they will petition almighty God to grant the fullness of justice in the Catholic faith. Jews, too, with rejoice and say that he whose coming they have denied is already here. That period of peace that preceded the first coming of the incarnate Son of God will be totally and utterly realized in those days. Brave men full of the gift of prophecy will arise so that in this time every seed of justice will come to flower among the sons and daughters of the human species..."
Such is how St. Hildegard describes the Second Pentecost in which the full number of Gentiles enter the Church followed by the conversion of the Jews prior to the advent of Antichrist and the Great Apostasy. Note how she uses the explicit phrase "period of peace" (as opposed to "era" which is practically the same as millenium) but note also how she equates it with the Pax Romana (Romania Peace) instituted by Augustus Caesar in 27 BC, a mere twenty or so years prior to the birth of Jesus and the first coming of the incarnate Son of God. This Romania Peace was essential for the later spreading of the Gospel using the very transcontinental and transnational roads, networks, secure borders and supranational citizenship (St. Paul was a citizen of the Roman Empire) which enabled the First Pentecost to lead to mass conversions over time. Some thirty or so years after Pentecost, in the AD 60s, Nero came on the scene and initiated the first mass persecution of Christians. He is a type and forerunner of Antichrist. I would hope folks are seeing the symbiosis between the two ascents of Christmas that St. Hildegard theorised. "...The Princes and everyone else will put God's decrees into proper practice. They will forbid all weapons used to kill people and only tolerate such iron tools as are needed in farming and for the benefit of humanity...In these days a true summer will reign through God's power...Countless heathens will cling to the Christians and will be baptised...These days will announce the coming of the Day of Judgement, they will be strong and glorious, full of peace and stability, like armed soldiers lying on a cliff to waylay their enemies..."
Consider that final criterion - the period of peace with be like "armed soldiers lying on a cliff". Yes, for the threat of violence and shadow of war will still hang over humanity even in the absence - indeed proscription - of actual armed conflict, this fulfilling Christ's prediction of the "rumours of war" that will exist even in the absence of hostilities. This is the "katechonic" dimension of the peace. It is like an armed peace in the sense that the people enjoying it must continually be on their guard, "restraining" the manifestation of Antichrist. Yet we know that they will ultately fail. The katechon will be removed, humanity will become complacent in accepting the apparent permanence of this "peace and security" such that they will bring it to an end by means of their own apostasy from the truth. Romans 11:16 refers to the Catholic church , not the Israel state nor her inhabitants, nor the world's jewish population. hopefully we are not headed to this. Emmett, I think we need more analysis solely about the new text from the biography of Sister Lucia, the one in which she begins "The tip of the spear as a flame unlatches and touches the axis of the earth..."etc. There is not much information about how this vision could possibly fit in with the Third Secret. Can you devote a post just to that alone?